18k yellow gold case with a brown croco-embossed leather strap. Fixed 18k yellow gold bezel. Silver dial with gold-tone hands and Roman numeral hour markers. Date display appears at the 3 o'clock position. Self winding automatic chronometer movement. Scratch resistant sapphire crystal. Solid case back. Case diameter: 36 mm. Case thickness: 8.6 mm. Tang clasp. Water resistant at 30 meters / 100 feet. Functions: hours, minutes, seconds, calendar. 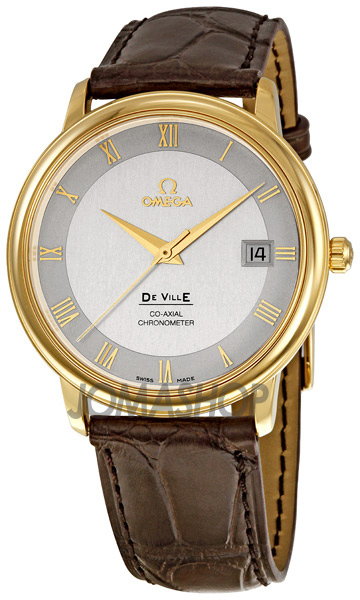 Omega Deville Prestige Yellow Gold Case Mens Watciaoh 4617.31.02.